Drink, fire, and chance meeting are pleasant enough, but, well - this isn't the Shire. Bet money and try to throw your axe at the target without missing. What do the guys from the movie Lord of the Rings do in shooting breaks? They arrange the Dwarfolympics, throw axes and drink a lot of beer! It takes a keen eye, a strong arm, and an iron gullet to come out on top in the Dwarven game of Swig sc Toss. Bring your gold and bring your tankard to make a name for yourself and get richer in the process. - There are a roral of ten rounds, each preceded by wagering as to whether or not you'll hit your target. - Aim for the red circle on the wall. Use your mouse to control the aiming device. - Click and hold the left mouse button to start the needle moving up the accuracy bar. - Release the button while the needle is in the green area of the accuracy bar. - Between rounds, you can drink from zero to three drinks. - Each drink allows (and forces) you to wager a greater percentage of you current bank. However, each drink also makes aiming and accuracy more difficult. - Be careful - if you drink to much, you will pass out! 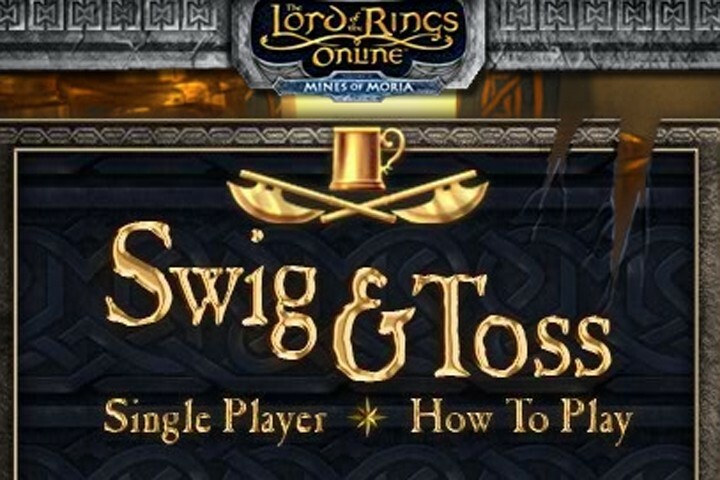 If you want to play Lord of the Rings Swig and Toss games online you have come to the right place! GamesLoon adds new Lord of the Rings Swig and Toss games every week. This is your game portal where you can find the biggest collection of free Lord of the Rings Swig and Toss games online. Do not forget to rate our Lord of the Rings Swig and Toss free online games while playing!